“A vivid take on the classic sportboat. 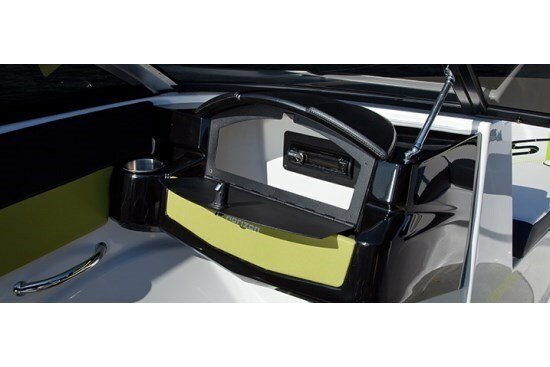 The all-new RS Series sportboat has an edgy attitude and a riveting black-and-lime exterior color scheme that will make your pulse race,” states Four Winns in describing its RS series. Of the twelve Horizon Series runabouts that Four Winns offers for 2013 from eighteen to thirty-one feet, this “RS” upgrade is available for only three of them; the 180, 190, and 200 models. This means that if you choose this upgrade, it could mean that you might have a fairly exclusive boat. And certainly one that will stand out due to its bright, contrasting exterior and interior colour scheme. For 2013, Cadillac, Michigan-based Four Winns offers a total of thirty-five models of runabouts, cuddy cabins, deck boats, and cruisers from eighteen to forty-seven feet in six series. The Horizon 190 is available as such with this nomenclature as a standard model, the upgraded RS, subject of this review, or as a Signature Series SS model with a different custom interior/exterior treatment with a low-profile windshield, and a larger lounging sunpad. Items standard with the RS designation, but which are optional or not available with the standard H190 include a most practical stainless steel bow scuffplate, pull-up style stainless steel cleats, more comfortable and cooler swim platform mat covering, flip-up bolsters on the dual ComfortRide adjustable bucket helm seats, snap-in cockpit carpet, aluminum wheels on the standard equipment trailer, plus of course the aforementioned RS hull gel scheme, graphics and custom RS carbon fibre textured vinyl upholstery covering. You can also choose to go full out with the RS scheme and optionally choose the custom coordinated RS snap-in cockpit carpeting. If however, you didn’t happen to like the RS colour scheme, many of the above standard RS items are available for the base H190, some individually, and some contained within two optional package groups; the LX Package and the SLX Package. These two packages would upgrade the H190 to virtually become the H190RS only in a different choice of exterior and interior colours and materials. With either configuration, you can add a Convenience package which includes an hour meter and a depth sounder with air and water temperature readouts. There are a number of standard premium features on both the H190 and H190RS worthy of note such as the generous use of stainless steel for example in the grab handles and cupholders. The stringers and cockpit floor are all molded fiberglass as is the engine compartment liner and the seating has what Four Winns refers to as “Stay-Dry Foam.” In the seats, “stainless steel springs compress any moisture out of the Comfort Foam; water passes through the reticulated foam and is shed from the bottom of the rotocast plastic base.” Seating is covered with Aquaflex™ white vinyl with Silvertex™ colour vinyl. 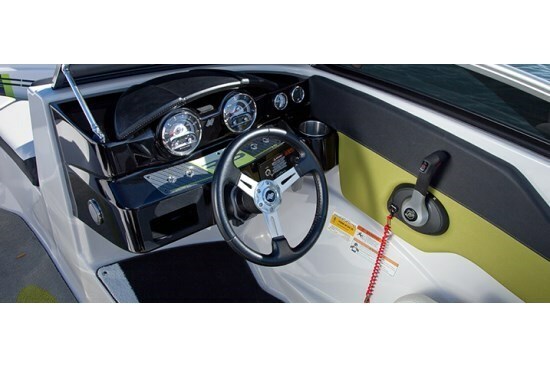 Other notable standard features include Four Winns’ angled, deep reach swim ladder with wide step pads, hinged cushions in the bow, unique swim platform lounge seats, remote power trim switch at the transom, a Sony® AM/FM/CD with iPod®/MP3 port within the lockable passenger side glove box plus two speakers, a Four Winns® custom-matched bunk trailer with disc brakes and swing away tongue. For options, choose a bimini top plus additional canvas, perhaps a premium sound system, bow filler cushions, a bow anchor roller, and for wakeboard lovers, a colour matched and hinging arch complete with bimini top. You will also need to choose your favourite power from either Volvo Penta® offering 200/225 horsepower, or from MerCruiser® offering 190/220 horsepower.